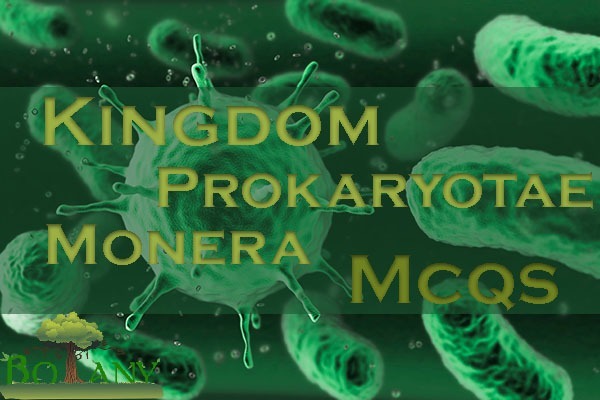 Kingdom prokaryotae Monera mcqs: Kingdom Prokaryotae / Monera consists of organisms with prokaryotic cells. In Greek language the meaning of word Pro is “before” and karyon refers to “nucleus”. So prokaryotes are cells that do not have true nucleus. It mainly consist of bacteria. The kingdom prokaryotae Monera mcqs are important for NTS, MCAT, NUST, AGHA KHAN and All Universities tests. kingdom prokaryotae Monera mcqs: Students are always searching for important mcqs questions. Here are important kingdom prokaryotae Monera mcqs which students can prepare for their important exams. Which one of the following is the most resistant stage found in bacteria? If a bacterial cell divides in every 20 minutes, how much time it will take in the formation of 8 bacteria? Which of the following Archaeobacteria? Which one is the phase of rapid growth in bacteria? Which one is a cyanobacterium? Which effect is one that kills the microbes immediately? Which structure is not found in all bacteria? Which one is the example of cocci bacteria? Gram positive bacteria contain less of __________ as compared to Gram negative. Which of the following is present in both gram positive and gram negative cell walls? Which of the following bacteria is a bacillus?